We consider your first visit with us the most important visit. It’s where our relationship with you begins, and we get to know each other. At Family Roots Dentistry, your initial examination is unlike your average dental “check-up” that can oftentimes be quick and impersonal. You may be wondering – “What exactly are we going to be doing at the first visit?” Scroll down and click on each section to learn more. You will be greeted with warm, friendly smiles as you enter our cozy office. 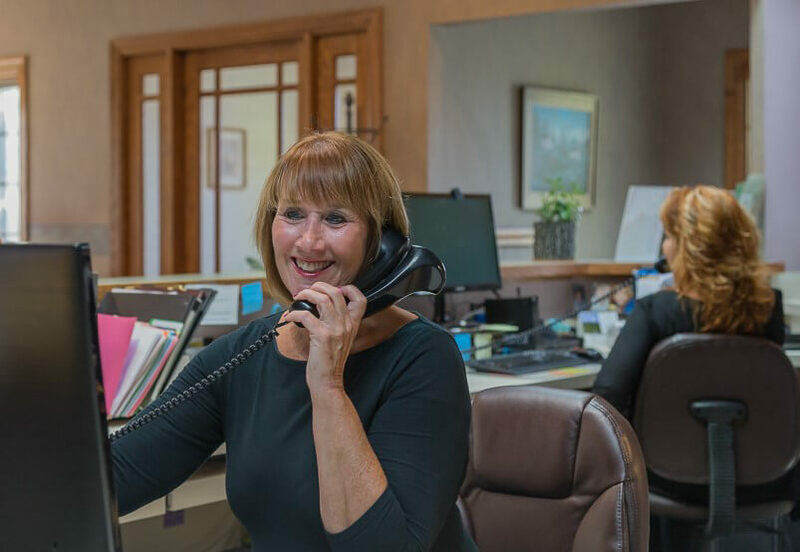 Don’t be surprised if one of our team members strikes up a conversation with you – they truly enjoy getting to know each patient. Help yourself to a complimentary beverage and if you arrive early, enjoy a magazine or book that you can choose from our large selection. Your first visit will begin in our consultation room instead of the exam room. Think of this as being like sitting around with your friends or family in your living room on a Sunday night. From telling us about where you grew up to showing us pictures of your family, we use this time to get to know you personally. Are you a patient that sees the dentist regularly? Does going to the dentist give you anxiety? Have you had a traumatic experience and not been to the dentist in years? We have helped all types of patients, and each patient’s situation is unique to them. We like to also use this time to learn about your dental history as well as about what dental goals you hope to achieve. We encourage you to use this time to ask us any questions or bring up concerns that you may have. The first step in building a relationship is establishing trust, and we want you to have the information you need to trust us with your care. We believe that excellence in dentistry begins with a careful diagnosis, which is why we pride ourselves in our detailed and thorough initial examinations. Extra-oral and intra-oral exam – in addition to evaluating your teeth, an oral cancer screening as well as a jaw joint and muscle analysis are also completed. We want you to see what we see. That’s why we have TVs set up in each exam room to review your radiographs and intraoral pictures as well as discuss any findings together. We encourage you to ask us questions. If treatment is recommended, we then work together with you to review your options and customize a treatment plan that best fits your needs based on your time, budget, and goals. We know that your time is valuable, and we will typically provide a cleaning for you at your first visit. There are certain circumstances, when gum and bone disease is present and gum therapy is indicated, that we may not be able to complete the entire treatment in the time reserved for your hygiene visit. The reason for this is because we are committed to delivering quality care and do not want to rush the treatment we provide for you. We do our best to identify these situations ahead of time and keep you informed. Your hygienist will thoroughly review oral hygiene instructions and home care tips tailored to you to help your teeth last a lifetime. You will leave the appointment with a reusable travel bag that has items your hygienist hand-picked especially for you. Not every patient benefits from any one toothpaste or one type of floss, and our hygienists provide you with the products that will best suit your needs.